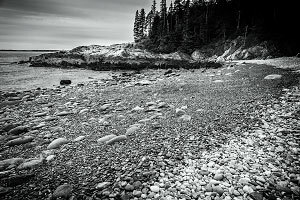 Little Hunters Beach is a quaint little cobblestone beach located west of Otter Point, along the south-facing coastline of Mount Desert Island. 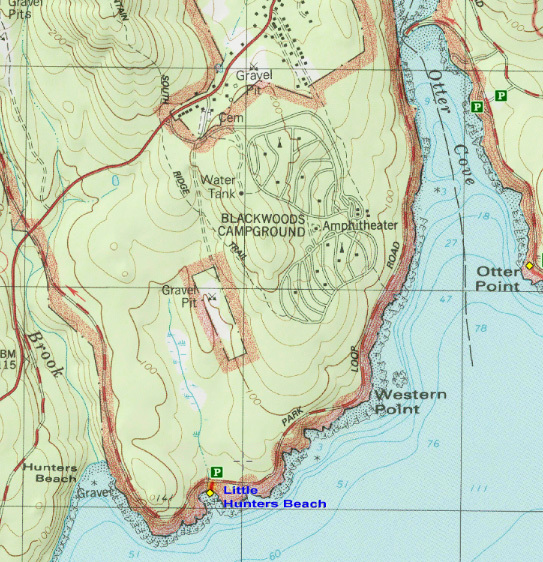 This spot isn't really a hike per se, but it is a fun little shoreline stroll. To find the trailhead, drive along the one-way Park Loop Road. Roughly 1.5 miles past Otter Cove, the road crosses a stone bridge; this is Little Hunters Beach! Park along the road in the handful of pullover spots. Hike down the beautiful wooden stairway that is located to the left (east) of the stone bridge and within moments you are at the rocky beach. Explore at will. Note that the beach takes on quite different personalities at low tide and high tide. It is also fun to explore the coastline to the east and west of the beach and there are several tide pools that children love to investigate. As always, take great care as the rock along the coast can be very slippery. And please do not take any cobblestone rocks off the beach; leave them for all to enjoy. While this isn't a destination hike, this is a good spot for those looking for a simple leisurely stroll in some pleasant Maine coastline scenery.